I have some great news to report. Late last week, Richard Flores, the editor-in-chief of Plasma Frequency Magazine, notified me that he wanted to buy my short story, “Movement to First Contact.” The story is scheduled to appear in Issue 4, which will be released on February 5, 2013. “Movement to First Contact” was the first story I wrote after I decided to start writing and submitting stories to science fiction magazines. It is only fitting that it should be my first sale. That said, it was the last of the eight stories I have submitted over the last year, because I wrote several revisions before I felt comfortable sending the story out into the world. Once Issue 4 is up, I will send an update. I encourage you all to purchase a copy of the magazine once it is posted on the site, especially since Plasma Frequency is the first magazine to take a risk on a new fiction author like me. 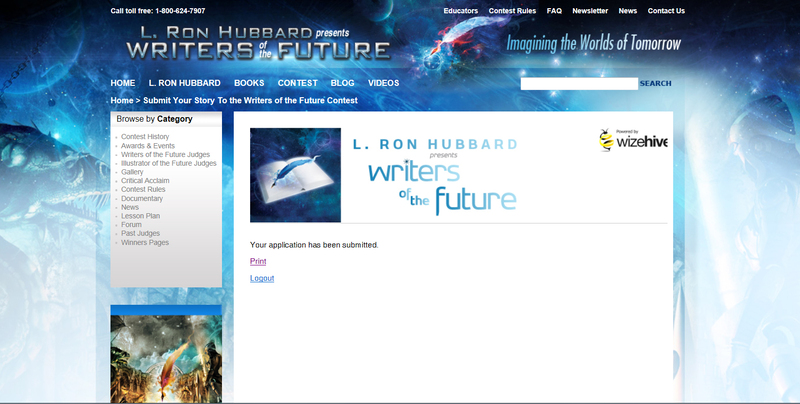 Back in August, I posted an update on the 1Q29 and 2Q29 quarters of the Writers of the Future Contest. In November, I reported the results for my 3Q29 submission. A few weeks ago, results came in for 4Q29. I earned my third Honorable Mention in 4Q29 (4Q12). My 1Q30 (1Q13) submission is currently in the queue awaiting judgement, and my 2Q30 (2Q13) story is complete and ready for submission. As promised, I have posted my overall progress in the Writers of the Future Content below. Hopefully, I win before I run out of space on this table. I hope to fare better in 1Q13 and 2Q13. The fact that I earned Honorable Mentions in three out of the four quarters in which I’ve entered the contest, gives me hope I can achieve or exceed that in 1Q30. At least this blog is keeping me honest. This entry was posted in Business, Science Fiction, Technology, Writing and tagged Fiction writer, Fiction Writing, First short story sale, L. Ron Hubbard, Plasma Frequency Magazine, Richard Flores IV, science fiction and fantasy, science fiction author, science fiction writer, Short story sale, WOTF, Writers of the Future Contest, Writing, Writing Contests. Bookmark the permalink. Congratulations Sean. Look forwarded to reading it. That’s great news Sean. I admire the hell out of your pursuit. All of us blogger are probably secret author-wanna-be’s; very few step out and put themselves on the line like you did. So here’s to you- brave and persistent. I’m looking forward to it – be sure to drop a heads up post when the issue is available. This is terrific news. Congratulations! Also, for the benefit of my readers, if you enjoy reading about the Titanic and time travel, please check out Marlene’s book, The Time Travel Journals: Shipbuilder. It was a semifinalist in the 2009 Amazon Breakthrough Novel Award Contest. Congratulations on your 3 Honorable Mentions! And, Best of luck in 2013. Congratulations on your 3 Honorable Mentions. Bets of luck for 2013! ; however, I bet your luck for 2013 is good!